Getting FREE media exposure is a lot like hitting the lottery; it can generate thousands of dollars in your bank account almost instantly! Join us this Thursday, when GuestMatch Chief Media Strategist Burke Allen picks the brain of seven time lottery game grand prize winner Richard Lustig, who has hit the media lottery dozens of times, appearing on dozens of national programs AND has hit the ACTUAL Florida lottery dozens of times for a combined millions in winnings! Richard Lustig says that luck has nothing to do with it; there is a method to hitting both lotteries, and he and Burke will give you exclusive insight. 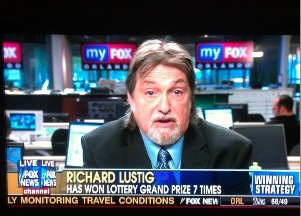 Author of LEARN HOW TO INCREASE YOUR CHANCES OF WINNING THE LOTTERY.